While the Weyland-controlled SSO Industries fuels innovation, it also inspires fear in all that oppose it. With an agenda to prevent the construction of a second Beanstalk and plenty of power to back it up, SSO Industries is a dragon on the shores of Lake Victoria—a shadow engulfing the sprawling metropolis. Situated in this shadow is a mysterious runner. A criminal preying on those around him for profit, this devil in disguise may be just as dangerous as the looming corporations. 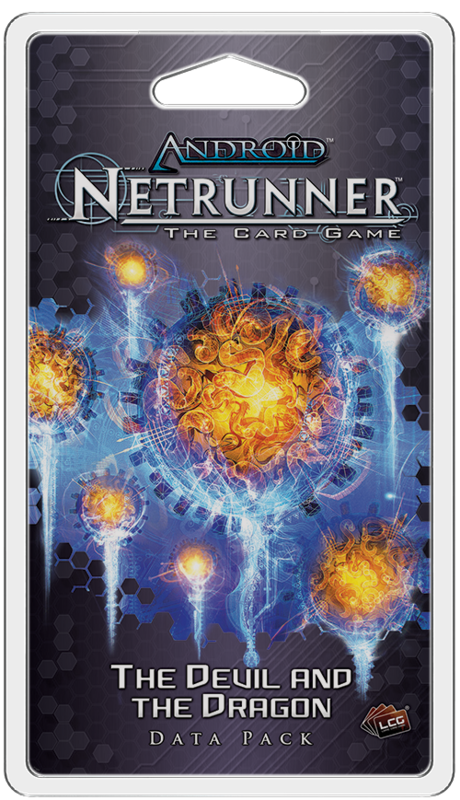 The Devil and the Dragon, the fourth Data Pack in the Kitara Cycle for Android: Netrunner The Card Game is available now from your local retailer or online through our website! 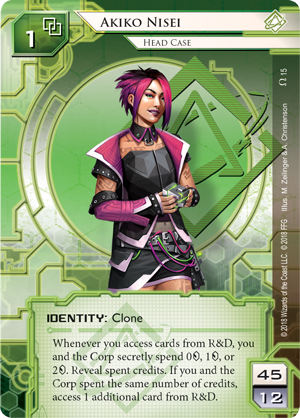 The Devil and the Dragon introduces new Criminal and Weyland identities, a new program for the ever-hungry Apex, and new ways for runners to delve into the corps' secrets, including a new way for Shapers to get a view into the corps R&D. Meanwhile, the corp gains new ways to increase their defenses through unique methods, including a barrier that features six sub-routines. Shapers excel at digging into R&D and exposing the corps’ agendas before they can even begin to advance them. 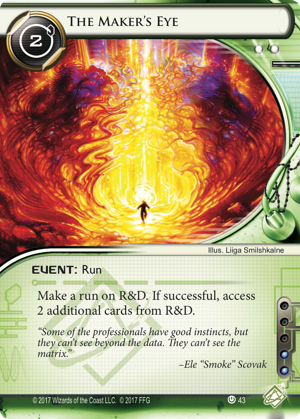 Still, just accessing a single card off the top of R&D gives you poor odds for finding an agenda. 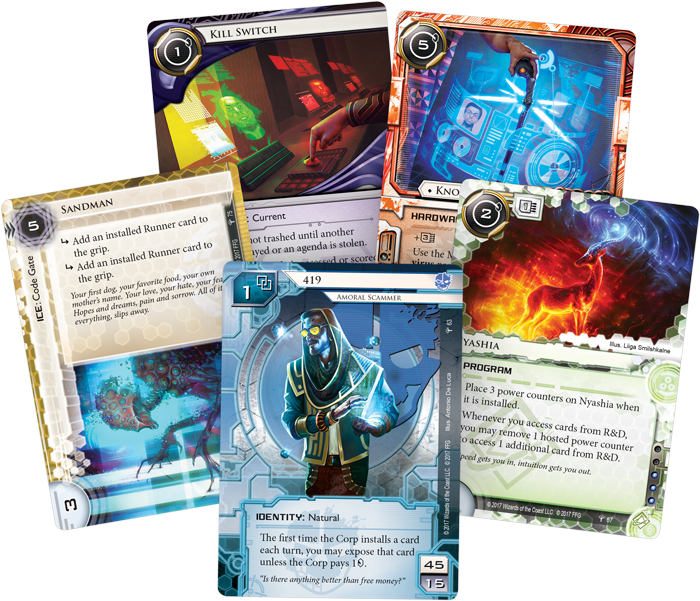 Luckily, cards like The Maker's Eye (Revised Core Set, 43) give Shapers the opportunity to dive even deeper, increasing their odds of finding the agendas they're searching for as well as getting an upcoming look at what the corp’s future holds. 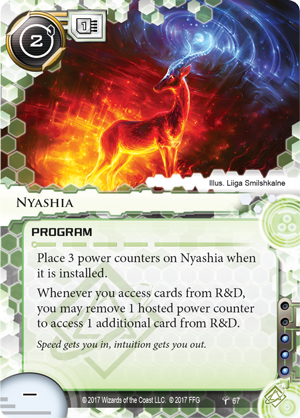 The Shapers receive another tool like this in the form of Nyashia (The Devil and the Dragon, 67), a program that lets them choose when they'd like to access an additional card from R&D by spending one of their three power counters after a sucessful run on R&D. 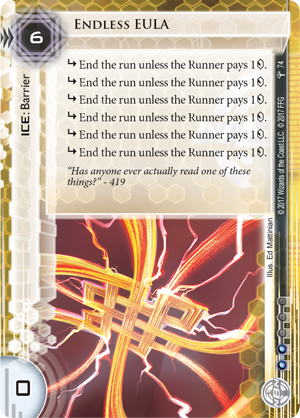 This deep-delving power can be used in conjunction with cards like the aforementioned The Maker’s Eye or the upcoming Akiko Nisei (Reign and Reverie, 15) to create a single large access happening all at once, potentially allowing you to win the game with one mighty run. Far from the joyous, free-willed tinkering of the Shaper, in the darkest parts of cyberspace there exists an entity driven by insatiable hunger. Apex lurks in the hidden parts of the net. He is a cautionary tale for hackers to tell each other in the dark, and in The Devil and the Dragon this monstrosity gains a powerful new tool. Consume (The Devil and the Dragon, 68) is a new virus program that promises to feed the hunger of Apex. 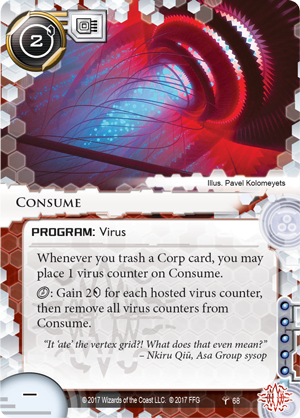 Whenever you trash a corp card, you can place a virus counter on Consume. For a click, you may then gain two credits for each virus counter on Consume before removing them all. Ultimately, Consume turns the corps' precious assets into raw data for Apex to feed on. Of course, the corp can purge virus counters at any time, but using their entire turn to do so will only hold off Apex for so long. Apex is coming, and Apex consumes all. Of course, the mega-corporations don’t concern themselves with rogue new programs or ridiculous rumors of monsters waiting in the depths of cyberspace. They're simply concerned with profit and the infinite march of progress. Some pieces of ice stop the runner, and others mire them down in the muck of legal text, simply making them want to stop. Endless EULA (The Devil and the Dragon, 74) is an expensive piece of NBN ice with little strength, but its true power comes in its multitude of subroutines. With six instances of ending the run unless the runner pays a credit, it will be quite expensive to get around Endless EULA without spending a significant amount of credits. Though it is the rare barrier that can be run through without an icebreaker, few runners will be wealthy enough to get through Endless EULA consistently, making it a constant thorn in the runner’s plans. Of course, other corporations use a more direct method for security. Kill Switch (The Devil and the Dragon, 70) is a new Haas-Bioroid current that gives the runner a shock whenever an agenda is accessed, initiating a strength-three trace that can end in brain damage for the runner. 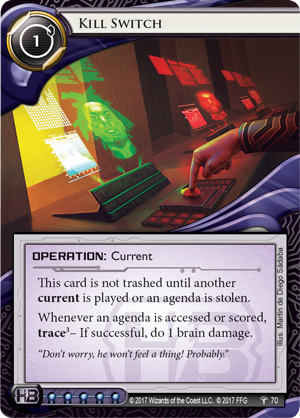 While the runner is desperate to steal the corp's agenda, they're putting their own well-being and sanity on the line every time they go diving into servers when Kill Switch is on the field. On the shores of Lake Victoria, a battle is taking place. The dragon of SSO Industries looms over the construction of a new beanstalk while a devil waits on the streets, preying on those who least suspect it. Which side will you choose? Upgrade your rig with The Devil and the Dragon (ADN53), available now from your local retailer or our website.